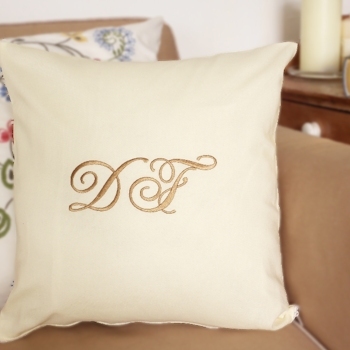 Beautiful personalised cotton cushion featuring a large monogram embroidery of your chosen initial making this gift bespoke and special. Approx 41cm or 16 inch square 100% cotton cushion cover in your choice of cushion colour. Please enter one or two initials or numbers you would like embroidered. Please enter one or two initials or numbers you would like embroidered. Select the font style you prefer. Beautifully sewn in a thread colour of your choice to make a fantastic Personalised cushion. A variety of cushion colours to choose from. This personalised cushion is a wonderful keepsake gift to commemorate a wedding, anniversary, birthday, or holiday! Personalised gifts are made to order - usually within 48 hours.